Tom Lawrence died unexpectedly on Wednesday 19th October 2011. We are deeply affected and very sad. He was a wonderful person to work with. Our thoughts are with his family and all those who were close to him. is a wildlife sound recordist, musician and educator. He is the recipient of the Adele Mellen Prize for ‚outstanding work‘ (Edwin Mellen Press July 2008) and was nominated for the President’s Award for Excellence in Teaching (May 2010). Tom has worked with directors for BBC, Disney, RTE, TG4, TV3, The History Channel and independent media on a range of sound and music works for film, radio, television and new media. His work in acoustic ecology regularly appears in natural history documentaries (please see Selected Works). 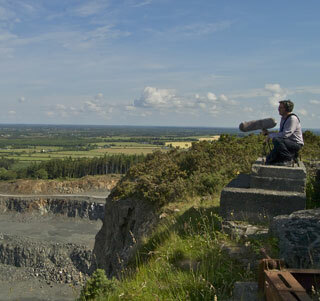 Tom also produces documentaries for radio broadcast, installations and his work has featured in UK, Germany, Denmark, Portugal, Canada and Ireland. Tom is on the staff of the School of Communications, Dublin City University where he is a lecturer in film music, recording practice and sonic art. His research interests are in the areas of film music and acoustic ecology. He regularly works with Max/MSP/Jitter and spectral analysis software. Tom has also worked as an external examiner for Dundalk Institute of Technology (Creative Media), Dublin Institute of Technology (Music Performance), National University of Ireland, Maynooth (Multimedia) and University College Cork (Law Dept.). He is currently an external examiner for Griffith College’s MSc Digital Media programme. He is a full member of the Irish Film and Television Academy, Irish Music Rights Organisation/MCPS, The Society for Musicology in Ireland (SMI), The Acoustic Ecology Institute and The Wildlife Sound Recording Society. Tom Lawrence is the Chair of the MSc Multimedia programme at DCU and is the liason officer for the Royal Irish Academy of Music, Dublin. He is also the President of the DCU Music Society and an advisor to the President on cultural activities and a member of the DCU/MDI/RIAM/SPD Music Steering Committee. Education: Ph.D (UCD), M.A. (NUI Maynooth), B.A. (UCC). L.T.C.L. (Trinity, London), MFTM (UCLA). He gratefully acknowledges the support of the Arts Council of Ireland and Aer Lingus. Tom records exclusively with instruments by luthier Philip Woodfield. A special word of thanks to SQN mixers and Nagra pro audio.